What’s the ultimate goal for an effective presenter? That’s a question that we are often asked. And for all its grandiose nature, there’s a simple answer. Keep your presentation relevant. That’s all. Relevant to your audience members who’ve made a personal commitment to be there, listening and watching. Yes, that’s it. Be relevant. And the perfect thing is that being relevant for your audience isn’t a great struggle for any would-be presenter. Three top tips will help out for starters. 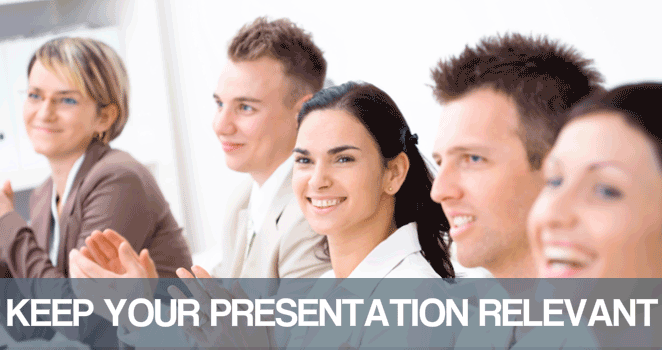 Here are 3 ways to keep your next presentation relevant for your audience. You know the date of your presentation, you know the time and you know the place. You should also know the event’s title, the event’s theme (if there is one) and the purpose of the event. This is a lot more than went into the Baroness Scotland speech that started late and finished early! Remarkable. And you should also know who’s going to be there. Is it a co-opted audience? An audience that’s required to be there by management. Or is it a self-selecting audience? An audience that’s read about your presentation, and probably you, and have opted to come along and listen. In both cases you should know beforehand who’s going to be in the audience…or at least the profiles of your audience members. With a co-opted audience, you can expect to see a guest list with names, titles, occupation and employer details. If you aren’t offered a delegate list by the event organiser, then ask to see it, nicely! With a self-selecting audience, again there’s likely to be a delegate list. Ask to see it. Once you know who’s coming you can profile their demographics, industry sectors or market segments. Delve into the job titles of your prospective audience. Dig further into the businesses or professions that will be there on the day. All the time ask yourself the question, what’s in it for them. Then try to answer that question. That’s an important question, because your audience has asked that question of themselves, and they’ve come up with a positive answer. That’s because they reckon there’s something in your presentation for them! So, don’t disappoint them. Because it’s really important to know your audience as President Trump found out the hard way. When you’ve got a good idea of the people in your audience you are well set to reference them or groups of them in your presentation. And then set out the answer to the dilemma you’ve posed. Note, also, that it’s important to “spread the love” when you reference your audience. Remember the architects and the quantity surveyors in your audience and pose a question or a point for them. It works a treat, not least because it shows that you know they are there, and importantly, why they are in your audience. Prepare answers to questions. Because when you are prepared for questions, after or during your presentation, you highlight your good practice. Inescapable good practice. It’s good practice because it makes you feel confident. But it’s also good practice because it keeps your presentation relevant. what questions will this presentation pose? which questions will come from this particular audience? what questions will your audience ask with today’s news and today’s events in mind? And that’s it. Questions posed yesterday with one audience will always be different to tomorrow’s audience exposed to tomorrow’s events, tomorrow’s news. Your job is to keep on top of this…ask yourself the likely questions for each occasion and then prepare your answers. You can learn more about how to keep your presentation relevant with a public presentation training course organised by Time to Market at a training centre near you. So, when you feel the time is right to boost your skills, please don’t hesitate to get in touch.